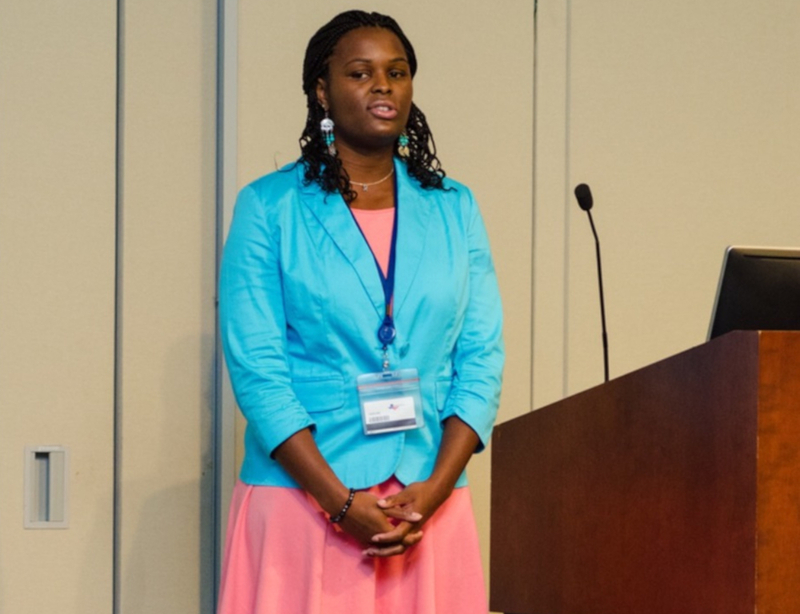 Natasha Renee Burse, a DrPH student at Penn State College of Medicine, was selected as a finalist in the MD Anderson Elevator Speech Competition. She presented her research project as a summer intern at MD Anderson Cancer Center in Texas. Natasha Renee Burse, a graduate research assistant and doctor of public health (DrPH) student at Penn State College of Medicine, is working to improve outcomes for minority women diagnosed with cancer. Burse&apos;s white paper, “Public Health Initiatives to Reduce Racial Disparities in Breast Cancer Survival,” shows that while overall breast cancer mortality rates are decreasing, racial disparities in survivorship remain. For Burse, this hits close to home. Diagnosed with cancer in 2015, she knows firsthand what it feels like to navigate through treatment options and the health care system. “I thought about my personal experiences with breast cancer. How was my journey different from what other young black women experienced?” Burse asked. Burse found that most black women do not receive genetic testing, and many encounter barriers during their diagnosis and treatment. Research shows that black women experience more aggressive forms of breast cancer at younger ages, later stages, with larger tumors. In light of her diagnosis, Burse began looking into modifiable factors — genetic testing and lifestyle choices — and unmodifiable factors — age, race, genetic mutations, tumor biology and family history. She found out that genetic testing, exercise and physical activity play significant roles in breast cancer risk reduction and management. Burse is passionate about helping minority women make informed decisions regarding their health. Working with fellow researchers at Penn State Cancer Institute, Burse is promoting awareness and helping women diagnosed with cancer by engaging them in physical activity. “In order to engage and sustain minority individuals in healthy activities, we need to address their barriers and develop effective, culturally tailored strategies to increase their participation in healthy activities, which can help reduce racial disparities and increase breast cancer survival rates,” Burse explained. This is exactly what Burse plans to do, and one way this can be accomplished is through community partnerships that can help educate and motivate individuals. Her findings urge medical providers and public health professionals to collaborate with influential support systems within the black community, such as churches, beauty salons and social groups. “We need to figure out what the community health needs are, what resources are available and modify the built-in environment and partner stakeholders to improve community health and health behaviors,” Burse said.